One of the first questions that came up in the Venus Index forums was about “Cellulite”…specifically, how do you get rid of it?! 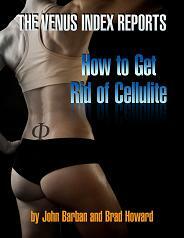 In today’s podcast Bryan and I get to the bottom of what Cellulite is and what you can do to get rid of it. For starters ‘Cellulite’ is a slang term that has no scientific meaning, but physicians and researchers will know what you’re talking about when you refer to ‘cellulite’. The reason women get it but men don’t is because there is a genetic difference in the basic structure of fat cells in women vs men. Various options exist for dealing with cellulite including liposuction, fat injections (yes one of the treatments is to just cover the cellulite with more fat!) and the one I tend to favor; losing weight. hOW about skinny women who have cellulite? I am the lucky one who had never had cellulite no matter if fat or slim. But I have seen with my own eyes in the gyms changing room really skinny women that had cellulite. How about water retention and circulation problems in such areas as buttocks and legs? Do you know anything about it? There is genetic variation with the way each person lays down fat, some women can be relatively ‘lean’ and still have some cellulite in certain areas simply because of their genetic predisposition to store more fat in that area. Regardless of how ‘skinny’ a woman seems to be the only for sure way to get rid of the cellulite look is to reduce bodyfat low enough that it no longer produces that ‘dimpled’ look. This is possible for everyone, it’s just a matter of how low you need to go before the ‘cellulite’ look goes away. Have you heard of “skinny fat”? ….Is a term used for women who might seem skinny but in reality have a very low muscle % and then fat…..is a bit more complicated than that.